This came as a huge surprise to me, so I am going to take a chance and assume that it is in fact news to others. 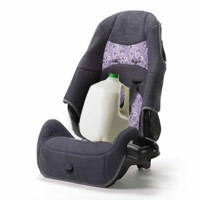 Car seats, booster seats, and infant carriers expire. Thankfully they last longer than your average gallon of milk. I had always thought that so long as a car seat had not been in a car accident that it was still safe to use. However, after six years research has shown that the plastic used in making the seats can begin to deteriorate, making the seats more brittle and prone to malfunction. Most car seats now have their expiration dates printed somewhere on them. If they don’t, you will be able to find the date of manufacture and can figure out when that six years is up! I’m not a huge fan of buying used car seats, you can never really know if they have been in an accident or not. Most car seats are designed to only survive one accident. (Perhaps car seats need to have their own version of Carfax?) However, if you find yourself needing to purchase one used, make sure to check the expiration date before you spend your hard earned cash! Along all these same lines is the need to make sure you instal your car seat correctly. If you are unsure, many fire departments, police stations, and even hospitals will check your installation for you. It may seem slightly neurotic, but it is always better to be safe than sorry! If you need help finding a car seat inspection site, or more information about your state’s child safety laws check out www.seatcheck.org. You can also check out www.safecar.gov for additional information about traveling safely with your kids. It’s always good to remember that kids are safest in the backseat!